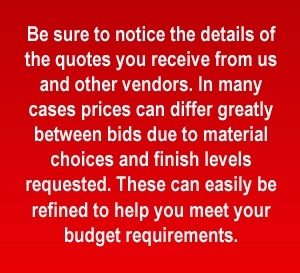 Each quote request we receive is closely examined by our engineering team to ensure you get the best price. Please fill out this form and provide as many details as you can in order to get the most accurate quote possible. Thank you for choosing Proto Technologies. PLEASE NOTE: If you do not receive a confirmation please re submit or call PTI at (509) 891-4747 or send direct to quotes@prototech.com (10 MB) or prototech.quotes@gmail.com (unlimited) Thank you. A total of 100 meg max per quote request. If you do not have a complete file, we can provide you with a close estimate based upon your X, Y, Z dimensions and the approximate volume of your part. We offer 5 different rapid prototyping finish levels as well as custom finish levels for machined parts. Typically if you do not choose a finish level above or indicate a finish level on your drawings, we will quote you a 3/2 finish level for your rapid prototyped parts. Custom colors, color matching, painting, urethane colors available. Texturing (mold texture or finish texture) available. Labels, logos, silk screening, laser etching, etc., available. Removal of build support structures. Typically used by customers wishing to do the finish work themselves, this will result in a relatively unfinished part. Removal of build support structures and light sanding with 220 grain sandpaper to remove rough edges and burrs. Typically used for design reviews, design verification, assembly verification and conceptual models. Build layer lines, stair steps and facets are visible. Sandblast. Typically used for design reviews and assembly verification where a higher degree of fit and part finish is required. Geometry fit checks, form and function tests, sand casting, pilot builds, and manufacturing engineering fixturing. Typically used for marketing presentations, focus group studies, investment castings, precision sand casting, rubber mold masters, and spray metal tooling masters. Painted. We can match any color, texture or finish as required. *** If you have a tight deadline, don’t be afraid to ask us about expediting your delivery. Specify color or material requirements in project notes. Standard resolution of .007" for ABS, Nylon, and Polycarbonate, and .010" for ULTEM will be quoted unless alternate requested. See Data Sheets for layer thickness options for each material. Specify color or material requirements in project notes below. The maximum size for all your files to be uploaded must not be larger than 100MB. If your files are larger than 100MB, feel free to submit multiple requests or note in the field below that you are unable to upload your files.